Stairways come in various lengths and widths. Shouldn’t stairlifts, as well? Most staircases are wide enough to accommodate a standard stairlift, but not all are. Older homes, particularly those built during the early 20th century and before, may have narrow staircases. Don’t let a small or narrow space be a deterrent in increasing accessibility. Instead, find a compact stairlift and add it to your home or commercial building for better mobility and accessibility. In terms of functionality, compact, or narrow, stairlifts are no different than standard size models. Even with a smaller size, a compact stairlift safely moves an individual from one floor to another, or from the bottom of the staircase to the top, with ease. Composed of a track and a chair, a stairlift is installed to a wall or directly onto the stairs; compact stairlifts, such as our Indy Pinnacle, are installed onto the wall behind. The system uses direct or battery power to operate and can be used a limited number of times during a power outage. Compact stairlifts are equipped with standard features. The seat, armrests, and footrest fold up at either end of the staircase, and a swivel seat and emergency switch are added. The latter feature stops the stairlift when the chair encounters an obstacle. Available in commercial and residential models, the Indy Pinnacle Stair Lift is ideal for narrow spaces or for conserving space on a larger staircase. The narrowest stairlift on the market, the Indy Pinnacle sits only 11 inches from the wall once installed and fully folds up at either end, allowing space for non-users taking the stairs. The device uses a helical drive system and supports up to 350 pounds. 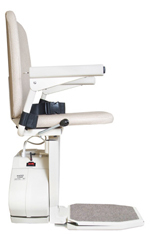 As various body types may need to use the stairlift, particularly in commercial settings, the Indy Pinnacle has an adjustable seat.